Ana is an M.D. and Research Fellow at the Institute Global Health and Innovation. Her current research projects focus on big data and digital technologies to deliver safer, more effective, and patient-centred care, with a particular focus on cardiometabolic diseases. 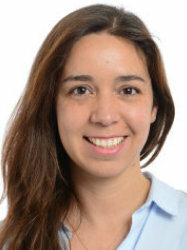 Ana qualified in Medicine (2006) and obtained her MSc (2009) from University of Porto. She obtained her Certificate of Completion of Specialist Training in General Practice in 2013, undertaking academic and research placements at Cambridge Health Alliance / Harvard Medical School Affiliate (Boston, 2010) and at the Institut National de la Santé et Recherche Médicale (Paris, 2011). In 2014, she was awarded a prestigious PhD fellowship from the Portuguese Foundation for Science and Technology to pursue a PhD at Imperial College London (2014-2018), under the supervision of Dr. Marc-Emmanuel Dumas and Prof. Jeremy K. Nicholson. She currently holds an open-ended appointment as Affiliated Professor at University of Porto (CINTESIS – Center for Health Technology and Services Research), and is Advisor to the Policy Response Group and Communications Advisory Board of the European Association of Family Doctors. In 2018, the was awarded the European Association of Family Doctors Scholarship 2018-2020, which purpose is to scout and stimulate future international leaders of Family Medicine/General Practice. She is also interested in global and international health, having collaborated as health advisor with several NGOs in low-income countries (Guinea-Bissau, 2008; Senegal, 2010 and Mozambique, 2013). In 2017, she co-developed momoby, a finger prick test aiming to bring healthcare to remote areas in low-income countries, which was awarded at various international competitions (Althea-Imperial Innovation Program 2017, 2nd prize [London]; I3S-Hovione Capital Innovation Prize 2017, finalist [Porto]; Hello Tomorrow Challenge 2017, shortlisted [Paris]; Venture Catalyst Challenge 2018, 1st prize [London], IDea Incubator 2018, 3rd prize [San Francisco].